Eliminate Acne and Feel Confident Again! Body Acne affects 50% of adult women and 25% of adult men. There’s no need to suffer anymore! Reverta’s Acne Spray is the easiest acne treatment in the industry and just half a minute a day is all it takes to eliminate stubborn (body) acne. It also contains ingredients that will make your skin glow. Without any harsh chemicals and with proven all-natural ingredients, Reverta’s Acne Spray will become your favorite skin care regimen. So take back your confidence and get rid of acne now! Most acne treatments use benzoyl peroxide as the main ingredient. Benzoyl Peroxide does not work as well against acne in the long run. It also causes skin irritation and redness with prolonged use..
Reverta’s Acne Spray gets rid of acne by using safe, highly effective natural ingredients: salicylic acid, tea tree oil and hyaluronic acid. For these reasons, salicylic acid, tea tree oil and hyaluronic acid are the most sought-after ingredients for acne-prone skin. Salicylic Acid occurs naturally in the bark of the willow tree. Salicylic acid is a beta-hydroxy acid. 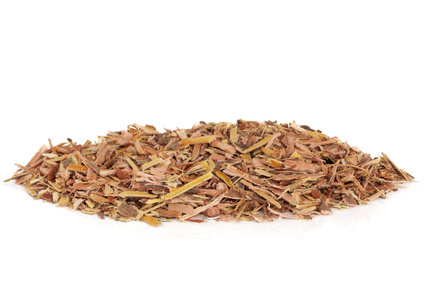 It is derived from natural sources (the bark of the willow tree). Its chemical structure is similar to that of aspirin. Salicylic acid is very effective against acne. It is much safer than benzoyl peroxide when used for long periods of time. Salicylic acid reduces pimples (including whiteheads and blackheads). It also lowers the production of sebum and renews the skin by promoting the shedding of old skin. It is also effective against old acne scars, by reducing skin discolorations. Tea Tree (Melaleuca alternifolia) essential oil has been used for ages as a topical antiseptic. Recent studies suggest that certain compounds in tea tree oil disrupt the outer membrane of bacteria. This is lethal even with low amounts of tea tree oil. Hyaluronic acid is a natural substance mostly found in skin, neuronal and connective tissue. Hyaluronic acid can absorb 1,000x its weight in water and is therefore one of the strongest natural moisturizers. In addition to being a great natural moisturizer, hyaluronic acid is able to repair damaged skin. It is easily being absorbed by the skin and does not clog pores. Acne is one of the most common skin conditions with multiple causes and symptoms. This is the reason why most acne treatments do not produce the results that you were hoping for: these products often treat only one cause of acne. 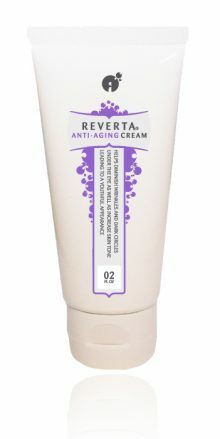 What sets Reverta Acne Spray apart from the competition? By not only taking care of one or two causes of acne, but by reducing all causes and symptoms of acne without using harsh chemicals. 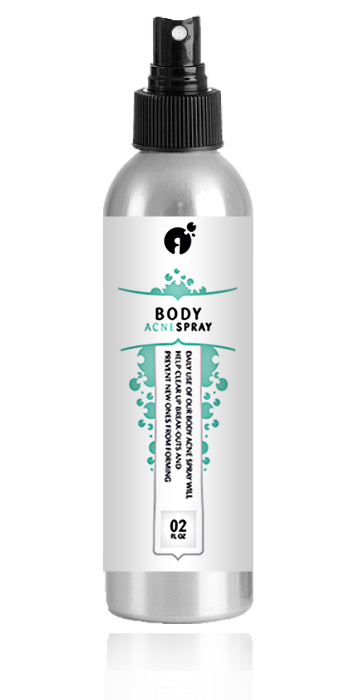 Use our Acne Spray daily and eliminate stubborn acne from your face and body quickly, effectively and safely. Without the risks and disadvantages of prescription medications. Thanks to Reverta’s Acne Spray, there’s no need to suffer from acne anymore! Re-gain your confidence and banish that annoying, embarrassing acne once and for all. One of the major causes of acne is the uncontrolled growth of the bacterium Propionibacterium acnes in the skin. The natural ingredients in Reverta’s Acne Spray all have superb anti-microbial properties to get rid of these acne-causing bacteria. 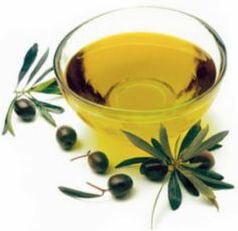 Tea Tree oil for example, contains unique components that disrupt the outer membrane of bacteria. This kills the bacteria, even at low concentrations of tea tree oil. In addition, tea tree oil also kills fungi and other micro-organisms. Ingredients in Reverta’s Acne Spray are not just anti-bacterial, but also anti-inflammatory. This reduces redness, swelling and acne. Salicylic acid also has amazing anti-inflammatory qualities. It is closely related to the active ingredient in Aspirin. First, tea tree oil slows down the production of so-called cytokines, which promote inflammation. Cytokines are released by the immune system in response to an infection or when tissue is damaged. Secondly, tea tree oil reduces the release of histamine, thereby slowing down inflammation and reducing itch. Furthermore, hyaluronic acid has also been shown to reduce inflammation. Salicylic Acid (SA) has been used for centuries as an effective skin exfoliator in order to reduce acne. The exfoliating properties of salicylic acid help skin get rid of dead skin cells (as in a gentle scrub), resulting in less skin pores clogging up. SA has the same benefits to skin as scrubs and peelings, but without the negative side effects of irritation, redness and damaged skin. Salicylic acid is a unique ingredient, as it is able to both exfoliate the surface of the skin AND remove dead skin cells and oils from within skin pores. SA is able to penetrate deep into skin pores. It clears out trapped oils that build up around the hair follicles. This will help to prevent bacteria from growing. It also reduces and controls the abnormal shedding of skin cells from the surface of the skin. The shedding of dead skin cells is further stimulated by hyaluronic acid. 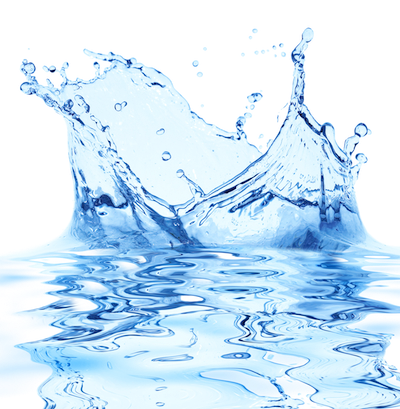 Hyaluronic acid also hydrates the skin, preventing the skin from drying out when dead skin cells are being shed. Daily use of Reverta’s Acne Spray will gently shed skin cells, while reducing oil build-up inside the pores. Exfoliating the skin does not only reduce acne, but is also helps other skin problems, including scars, dark spots and premature aging of the skin. The result is healthier skin with better skin tone. Buy Acne Spray and Try It Risk-free for 90 Days! One of the main causes of having pimples is the explosive growth of acne-causing bacteria, such as P. acnes. These bacteria feed on dead skin cells and oils found around the hair roots. Bacteria further stimulate skin oil production. Both salicylic acid and Tea tree oil reduce the formation of skin oil, effectively taking away food for these bacteria. The result is less acne. Younger looking skin with less blemishes, because Acne Spray by Reverta cleanses and unclogs pores. Salicylic acid and Tea tree oil also have unique anti-aging benefits by clearing out clogged pores and by reducing the size of those pores. Many factors (alone or in combination) can cause clogged and inflamed skin pores: these include over-growth of bacteria, excess dead skin cells, hormonal imbalance, stress, shaving, certain skincare product ingredients and genetics. Cells in hair follicles tend to multiply quickly. Mixed with too much oil, dirt and bacteria, this results in inflamed and enlarged skin pores. Tea tree oil and Salicylic acid penetrate deeply into the pores, where they clean, eliminate excess bacteria and reduce oil production. Salicylic acid also sheds dead skin cells from the surface of the skin, which further reduces clogging of skin pores. The ingredients in Reverta’s Acne Spray work together to unclog pores and reduce their size. The result is softer, less irritated skin with a beautiful, healthy glow! Among all exfoliating ingredients, Salicylic acid is mild and does not harm the skin. Many acne products use harsh ingredients and often result in dry, irritated skin (especially when used for a long time). Salicylic acid, Tea Tree oil and hyaluronic acid don’t have this side effect: they not just fight acne, but they also calm and soothe the skin. The result is incredibly smooth, less irritated skin without redness. Discover Acne Spray by Reverta Risk-free! Both men and women with acne-prone skin benefit from Reverta’s Acne Spray. The ingredients in Reverta’s Acne Spray aren’t just anti-bacterial and exfoliating. They have other, unique benefits that are often not found in other acne treatments. Salicylic acid is known to promote the renewal of skin. By promoting the shedding of dead skin, healthier looking skin will appear quickly. Recent studies also suggest that salicylic acid can promote collagen production, which will strengthen the skin. Collagen production decreases as we grow older, which results in sagging skin with more wrinkles. By stimulating collagen production, salicylic acid helps to reduce premature aging of the skin, with a visible improvement of fine lines and wrinkles. Hyaluronic acid further protects collagen and the structure of the skin, by hydrating the skin and improving the skin’s structure. The result is firmer, smoother and more elastic skin. In addition to being anti-microbial, Tea Tree oil is also a strong antioxidant, which helps acne-prone skin. As an antioxidant, Tea Tree oil can neutralize free radicals in the skin. It can also reduce the amount of reactive oxygen species (ROS) between skin cells. This is an important benefit, since people with acne have lower levels of antioxidants. Skin with acne is less able to get rid of these free radicals, which leads to high levels of Reactive Oxygen Species. Reactive Oxygen Species are toxic molecules that play a major role in inflammation. These free radicals are being released from certain white blood cells that are present in inflamed or damaged tissue. Once released, they cause damage to cell membranes and DNA. Recent studies suggest that free radicals and Reactive Oxygen Species play a major role in the formation of acne. The skin’s barrier function protects the skin from external threats. These threats include harmful bacteria and other microbes, UV rays from the sun and air pollutants. Daily use of Reverta’s Acne Spray makes the skin’s barrier function stronger. The most external layer of defense consists of the natural microflora on the skin’s surface. Under normal (healthy) conditions, the microflora (which consists of a variety of ‘good’ bacteria) will protect the skin from invading ‘bad’ bacteria. Acne-prone skin however, has too many bad bacteria such as the bacterium P. acnes. Daily use of Acne Spray will eliminate P. acnes and other acne-causing microbes. As such, the natural balance of the skin’s microflora is gradually being restored. 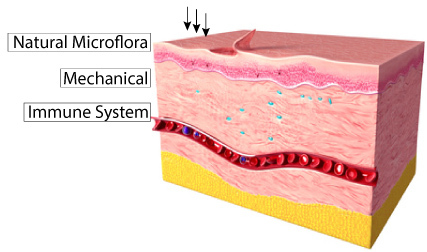 The second layer of defense are the structures of the skin that offer mechanical support, such as collagen and elastin. Acne Spray by Reverta stimulates both cell renewal and collagen production. This results in stronger, firmer and healthier skin that is better protected from external threats. The immune system is the third and final layer of defense. Recent studies have shown that Tea Tree oil is able to stimulate the skin’s immune system. In addition, hyaluronic acid and salicylic acid have been shown to improve the skin’s natural barrier function and thickness. Reverta’s Acne Spray is therefore able to improve the skin’s barrier function at all three levels. This translates to skin that is less sensitive to harmful bacteria and other factors that can cause acne. Buy Acne Spray and Try It Risk-free for 3 Months! Our Guarantee: If you don’t like it, we’ll refund your money. Body Acne often affects the shoulders, back or chest. It often gets worse during hot, humid weather, after work-outs and by wearing tight fitting clothes. Daily use of this spray will clear up body acne and help prevent break-outs. If you frequently shave arms, legs or chest, use of this product can prevent body acne and itch due to ingrown hairs. Gariboldi, S., Palazzo, M., Zanobbio, L., Selleri,S., Sommariva, M., Sfondrini, L., Cavicchini, S., Balsari, A. and Rumio, C. (2008) Low Molecular Weight Hyaluronic Acid Increases the Self-Defense of Skin Epithelium by Induction of β-Defensin 2 via TLR2 and TLR4. J. Immunol. 181: 2103-2110. Bassett, I.B., Pannowitz, D.L. and Barnetson, R.S. (1990) A comparative study of tea-tree oil versus benzoylperoxide in the treatment of acne. Med J Australia 153: 455-458. Shalita, A.R. (1989) Comparison of a salicylic acid cleanser and a benzoyl peroxide wash in the treatment of acne vulgaris. Clin Therapeutics 11: 264-267. Sarici, G., Cinar, S., Armutcu, F., Altınyazar, C., Koca, R. and Tekin, N.S. (2010) Oxidative stress in acne vulgaris. J Eur Acad Dermatol Venereol 24, 763-767. Choi, E.H., Brown, B.E., Crumrine, D. et al. (2005) Mechanisms by which psychologic stress alters cutaneous permeability barrier homeostasis and stratum corneum integrity. J Invest Dermatol 124:587-95.
distilled water, Carbomer 940, Sodium Salicylate, Salicylic Acid, Hyaluronic Acid, Citric Acid, grape fruit seed (Citrus paradisi) extract (preservative), Phenoxyethanol (preservative), EDTA, Triethanolamine, Essential oils of tea tree (Melaleuca alternifolia), White tea (Camellia sinensis) fragrance. This product is fragrance-free, but has a pleasant smell due to Tea Tree oil. Shake bottle before each use. Spray thin layer on affected area(s) 1-2 times daily and gently rub in. For use on face, spray product on hands first and then apply to face. If product gets in eyes, flush eyes with plenty of water. Do not use if you’re sensitive or allergic to salicylic acid.